This was an interactive quiz on the New York Times website, of all places. 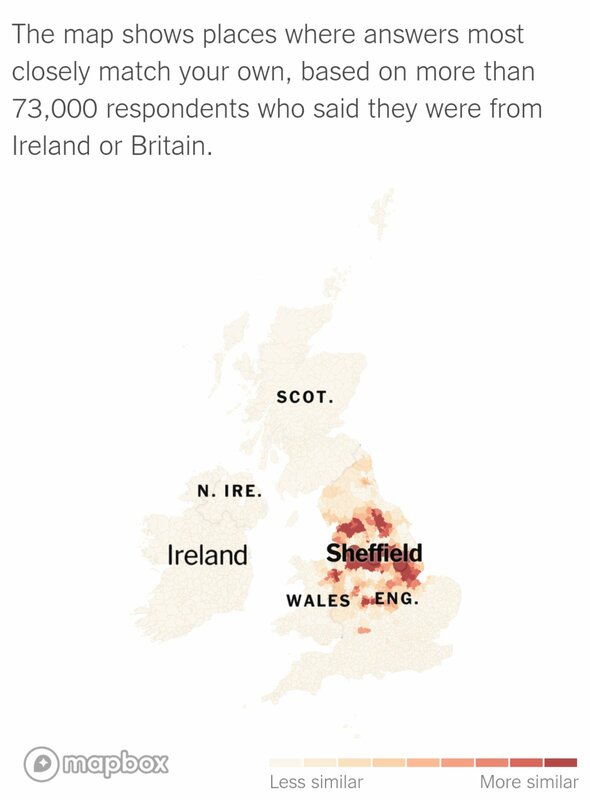 It asked me a few questions about what words I used for various things when I was a kid: infants, bread rolls, being grumpy and certain items of furniture, and then worked out where I was most likely to have grown up, given the dialect that I used. Apart from being extremely accurate, it brought back some great memories. Playing Tiggy-Off-Ground in the school playground (that’s On-On to my kids now), for example. It was our standard go-to game before school started in the mornings (but only because you weren’t allowed in the back playground before school and you weren’t allowed to play football in the front playground, obviously). And then there was that “being grumpy” question. To be fair, they could have pinpointed me with just that one answer. I really don’t think there’s anywhere outside Sheffield where “mardy” is a thing. As the test was unfolding, I was wondering if I could fool it into thinking I was from Newcastle, and yes I surely could have done, but that was hardly the point. If you’re reading this in the UK (and you’re from the UK), give it a go and let me know how you get on. I was binge-watching Only Connect again last night. I got as far as Series 11. Episode 21. The Scientists vs The String Section. And while there were many brilliant questions on offer, there was one which stood out for me, so I’ve elaborated upon it a little and reproduced it here. All you’re looking for is the thing which connects these clues. The sooner you get it (correctly, of course), the more points you score. That’s your lot, I’m afraid. If you’re still struggling (or if you’re not), the answer is down below. How quickly did you get it? Did you get it? Leave me a comment and tell me how you got on. I’m guessing that my resident Israeli reader might have got this one sewn up. Unless she actually went for “apple pies”. Because it’s not them. The earliest yet discovered reference to this thing is a religious one; it features in a Bulgarian translation of a Greek chronicle written by Constantinos Manasses in 1345. Held today in the Vatican Apostolic Library, it features it in place of the capital letter alpha “A” in the word Amen. Why it was used in this context is still a mystery. It first appeared on a typewriter in 1889. And it has no official name in English. The answer is… the @ symbol. Well done if you got it. We constantly hear numbers being used on the news and elsewhere in our daily lives, but do we actually think about what they mean and how they relate to one another? This site: http://www.isthatabignumber.com/quiz/ not only gets your grey matter working, it also helps you to put some some context to some of the big numbers you hear every day. And some you probably don’t. And that a Californian Sea Lion would beat a Komodo Dragon in a swimming/running race? Plenty more questions where that came from. Be warned: it’s quite addictive. Sometimes, dinner time Chez 6000 is actually just like a really hard quiz. Author 6000Posted on October 11, 2016 Categories learning curveTags dinner time, LinkedIn, quiz, websiteLeave a comment on What’s that website? There are four countries in the world which end in a letter which no other country does. Can you name them? For clarification, none of them are Canada – that’s because Canada ends in an A and other countries names also end in an A. Botswana, Algeria, India for example (and there are a lot more besides). OK, so I’ll give you one (ooer! ): Iraq. Iraq ends in a Q and no other country’s name ends in a Q. So now you have 1 out of 4. Can you name the other three? Don’t comment here (in fact, I’ll switch them off for this post), rather click here and send me an email. No prizes, save for maybe getting your name up here if you are one of the first to get it right. Oh – and no googling either, ok? Think, rather. UPDATE: Answers now published if you can’t get that brain working!